Think you have a bad cold? How much worse would it be if your anatomy included two throats, three noses, and five ears?! Little Alien’s parents and pet try to help him feel better in ways that will seem both familiar and out-of-this-world to earthling readers. When his son’s throats are sore, Daddy Alien zooms off in his spaceship and returns with a Milky Way milkshake. “Granny Alien’s Famous Shooting-Star Ear Drops” are just the ticket for earaches. And when Little Alien complains of his stuffy noses, Daddy Alien calls in the “lunar decongestants,” a trio of little green creatures who carry what might be construed as instruments of torture, especially considering the reactions of Little Alien and Mars Rover. 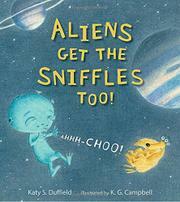 A cool meteor shower for his fever and a settling into bed, and all seems set for sleep…except for the sneeze. Mars Rover can’t take seeing his friend so sick, and so he pulls out all the stops to make Little Alien feel better. Campbell’s pen, watercolor, and colored pencil illustrations keep the focus on the central action, though there are enough tantalizing details of the alien world to whet readers’ appetites. Mama Alien is pink, Daddy’s blue, and their son is green. All are expressive.